Chris is part of the production team and handles all logistics from finished products to dry goods, coming to and from the winery. As well as an office-based role, Chris enjoys being hands on and working in the winery with the rest of the production team. 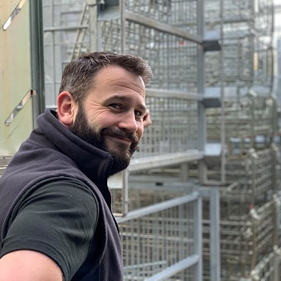 Prior to joining Ridgeview in the Autumn of 2018, Chris worked for Miller UK in Northumberland, as Distribution Supervisor for 8 years, before moving south to Eastbourne. When not at work, Chris is usually found on a rugby pitch playing for Eastbourne, his local team, followed by a knees-up in the club house with friends and family.